CHERRY HILLS VILLAGE, Colo. — A search was underway Monday morning for four suspects who were involved in a home invasion robbery and shooting, where an officer was struck by gunfire twice. An officer responded to 7 Sedgwick Drive around 10:50 p.m. Monday after someone called 911 and hung up, said a spokesperson with the Cherry Hills Village Police Department. The officer went into the home and encountered two home invasion robbery suspects. 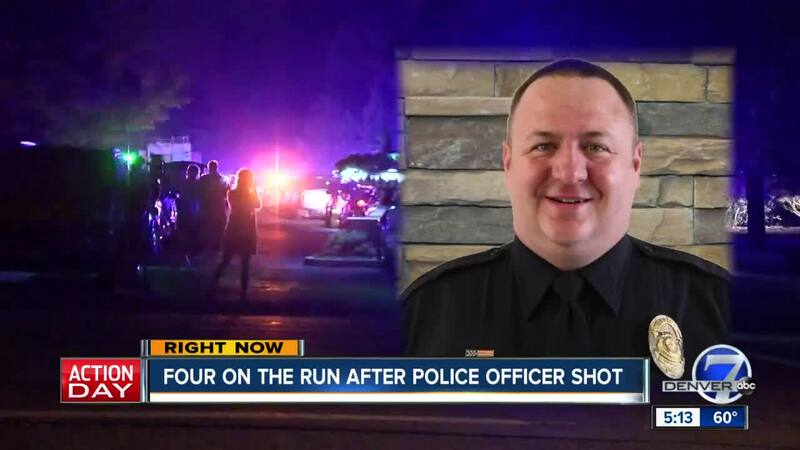 A shootout started and the officer was hit twice. Once above the left knee and once in the right heel. He went into surgery Tuesday morning but was out of surgery later in the morning. "The officer is in stable condition," said Cherry Hills Village police chief Michelle Tovrea. "I was with him earlier. He's with his family now and we have officers with him. He's in good spirits." The officer has been identified as Cory Sack. He has been with the department for seven years and has two children who know that their dad is all right. The suspects fled the scene. The family inside the home is OK.
"No one inside the home was injured," Tovrea said. Tovrea said they are looking for at least four people. Two have been identified as black males wearing dark clothing. None of the suspects are in custody. A shelter-in-place is still in effect, she said. Several SWAT teams and other groups are helping Cherry Hills Village police with the search. There is evidence at the scene, Tovrea said. A crime lab from Arapahoe County will be working with that for some time, she said. Neighbors say they are concerned, but not necessarily surprised by the intrusion. Elizabeth Johnson lives down the street and says her home was broken into just a couple years ago. "I was in the basement wrapping Christmas gifts," Johnson said. "And I heard the doorbell and I thought it was my grandkids. I came up and I confronted them. Oh yeah. They were inside." Johnson says in that case, the intruders fled and she chased them down to try and get their license plate number. "I chased them down the street in my car because I didn't think they would know how to get out of the neighborhood. But, they didn't have a license plate on their car," Johnson said. Police had a large perimeter surrounding the home in Devonshire Heights, which is in the area of S. University Boulevard and E. Hampden Avenue. Tovrea said she hopes that video cameras from the homes in this area will help with the investigation. Hampden Avenue reopened shortly before 3 a.m.
Police recovered a stolen vehicle nearby of unknown make or model that is being treated as part of this investigation, Tovrea said. Some parents of Cherry Hills Village Elementary received calls Tuesday morning about busses that couldn't get into certain neighborhoods due to the police presence. One message from the school district sent to parents said, "We wanted to let you know that there was police activity in the area of the Cherry Hills Village neighborhood overnight and that the police situation continues to be active. After consulting with Cherry Hills Village police, they've assured us that the school is well outside the perimeter of the police situation and it is safe for school to be open. Out of an abundance of caution, we will bring all students into school immediately upon arrival and there will be a police presence at the school throughout the day."